Come and say hello on 5th May. Levenshulme Pride is for everyone. We want your ideas. We need your help. Why not organise a Pride event with a group you are part of? 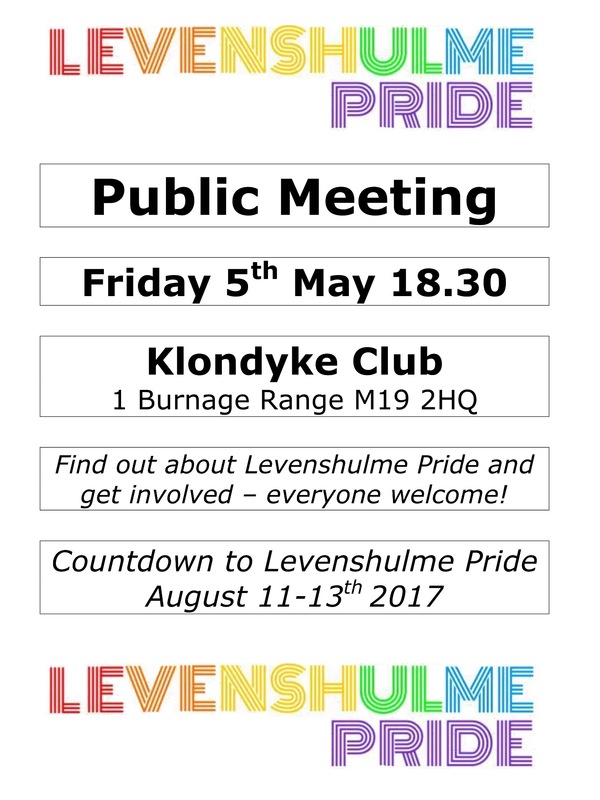 Help make Levenshulme Pride yours. 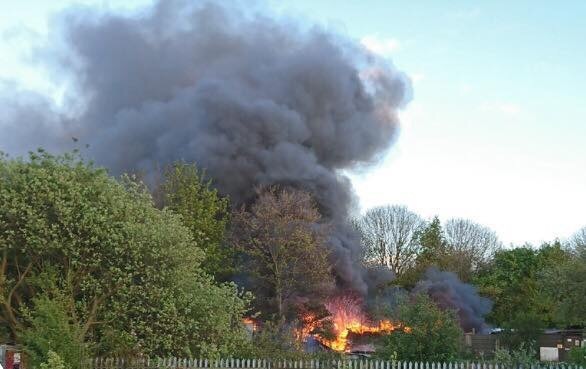 Family run Highfield stables in Levenshulme has burnt to the ground!!! 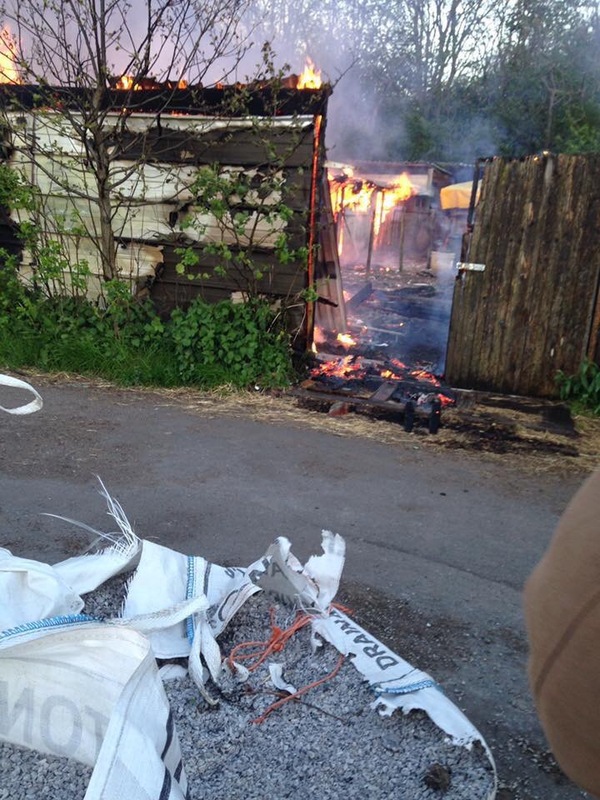 Thankfully the horses were got out in time but several chickens and a goose have been lost, along with a families livelihood. For the next few days help is needed to clean and clear the land. Do you have any decent wood or lumber you can donate? Any labour hours?! Please inbox Megan Powers if you can help or use this email for PayPal. or there is a just giving set up. If you can spare a few pounds we know how every penny counts…. The initial news report is here…. Just devastating but could have been worse, please please help in any way you can. Wendy who runs these stables is an amazing animal lover. I met her on a rainy summers night last year when a German shepherd dog was roaming in Levenshulme and I went to scan it. She was chipped to Wendy and was a stable dog. Concerned as to how she had got out and how she was living I met Wendy at the stables and was awestruck. We found the loose panel that looked like it had been kicked and secured the dog for the night. The stables were immaculate, as was every animal within them. She told me that Sheba was due to retire but it was hard to get the right dog. Months later a rescue friend of mine was struggling to find the right place for a gsd that was a neglected yard dog that wouldn’t settle indoors. Wendy took her in and took Sheba home. Later I needed a space for a semi-feral neutered mama cat I trapped in Old Trafford. Wendy took her in as a barn cat. Two fosterers had deemed Lulu too wild and unpredictable to be a pet, Wendy took her in at the stables. Shortly after she contacted us to say Lulu just needed the right quiet home as the only cat (she’s a Bengal), and she had found her one. Lulu now spends her evenings stretched out on a rug in front of a log burner. Last time I spoke to Wendy she felt the gsd had also rehabilitated and she may have found her a new, indoor, forever home too. This woman has a gift with animals and always puts their needs first, reads them so very well. Whether unfortunate (neglectful) accident caused by neighbours or deliberate, the family do not deserve to suffer this and need our help. Eight people ready for your questions TONIGHT. 19.00 at the Jain Centre, 667-9 Stockport Road, M12 4QE. Last summer two events in a matter of days reminded us that neighbourhoods like Levenshulme and Gorton can easily become divided on the grounds of class, race and religion. 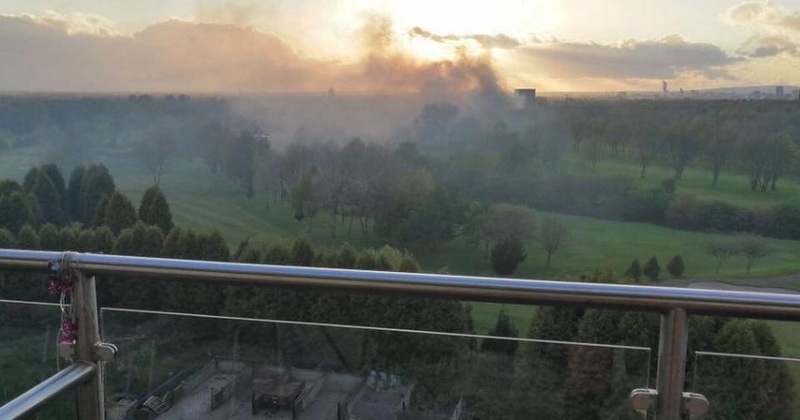 The terrible murder of Jo Cox MP, followed shortly afterwards by the EU referendum, was enough to prompt a diverse group of local residents from Levenshulme to join together for a Hope Not Hate vigil on the ‘village green’. At the vigil we pledged to get to know somebody who might hold different views from us. Since then we have seen the publication of Dame Louise Casey’s review of ‘Integration and Opportunity’ which found that social mixing and interactions between people from a wider range of backgrounds can have positive impacts; not just in reducing anxiety and prejudice, but also in enabling people to get on better in employment and social mobility. The review identified a wide range of ideas that encourage integration and social inclusion and reduce division and hatred including: English language learning, promoting activities that encourage social mixing, and empowering marginalised women. While we may not agree with every aspect of the Casey Review, the simple idea that in diverse neighbourhoods like Levenshulme it is important for people from different backgrounds to meet and understand better those things that make us different – and those things we hold in common too. This idea lies at the heart of what we try to do at the Inspire Centre on Stockport Road. Our busy community hub has welcomed people from very diverse backgrounds since it first opened in 2010; its board, staff and volunteers come from all walks of life and from different faith and ethnic groups. Many of its current activities celebrate the diversity found in our neighbourhood from capoeira classes to Arabic writing groups; from ESOL sessions to armchair aerobics. But until now we have never taken an intentional approach to promoting integration and empowerment. 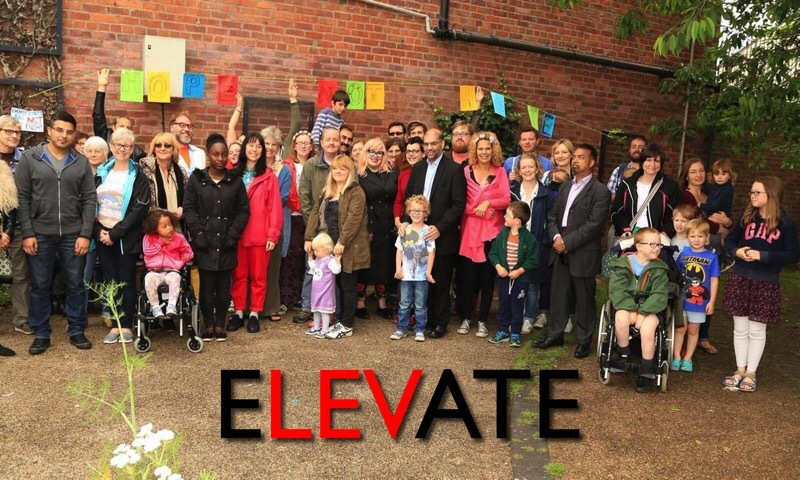 Our new project – ELEVATE – is designed to focus hearts and minds on this vital task. From now on we are going to be particularly keen to support any activity that promotes integration and empowerment. In practical terms this means that we will have a ‘suspended room hire’ fund so that we can subsidise our normal room hire costs for those activities that bring people together or empower people who are often isolated or excluded. We are going to develop a special Levenshulme Inclusion Charter which anybody can sign up to if they are committed to some basic principles of welcome, tolerance and support. And we are going to do some research about our local divisions and how we best overcome them. This will inform our project as it develops and as we try to become a special ‘centre’ for integration and cohesion in Greater Manchester. In the next few months we are very much in ‘listening mode’ and we’re keen to hear people’s views and ideas about our project. We’re also in ‘fundraising mode’ as we try to generate a modest fund to support this work. To this end, I’m running the London Marathon on April 23rd and if anybody would like to sponsor me then they can e-mail me with their pledge or sponsor me directly online by clicking HERE. Just when you were feeling short of an election to vote in! Friends of Leve Station Annual General Meeting will be on Wednesday 17 May at 6:30 pm at the Arcadia. Amongst other things the AGM will elect officers for the coming year and set a subscription (the proposal is to set this at a nominal £1 per member) so please try to attend if you can. The Friends of Levenshulme Station annual membership fee for 2017-2018 will be set at £1.00 per member. Notes: the following notes are an explanation only and do not form part of the motion. a. This isn’t about money – the few quid will doubtless be useful to cover small items we currently rely on individual generosity for but the issue is about sorting out our membership. b. We currently have a mailing list but no formal membership. The current officers want as many people to be involved as possible and want to keep an open list for everyone with any interest and to continue to welcome anyone interested to our meetings. However we believe that we do need a formal membership who can vote to elect officers and on any policy matters. c. Our constitution requires us to consider a membership fee every year – which has always been set at £0.00. We thought the easiest way to list actual members was to have nominal membership fee – the members are simply those who have paid. 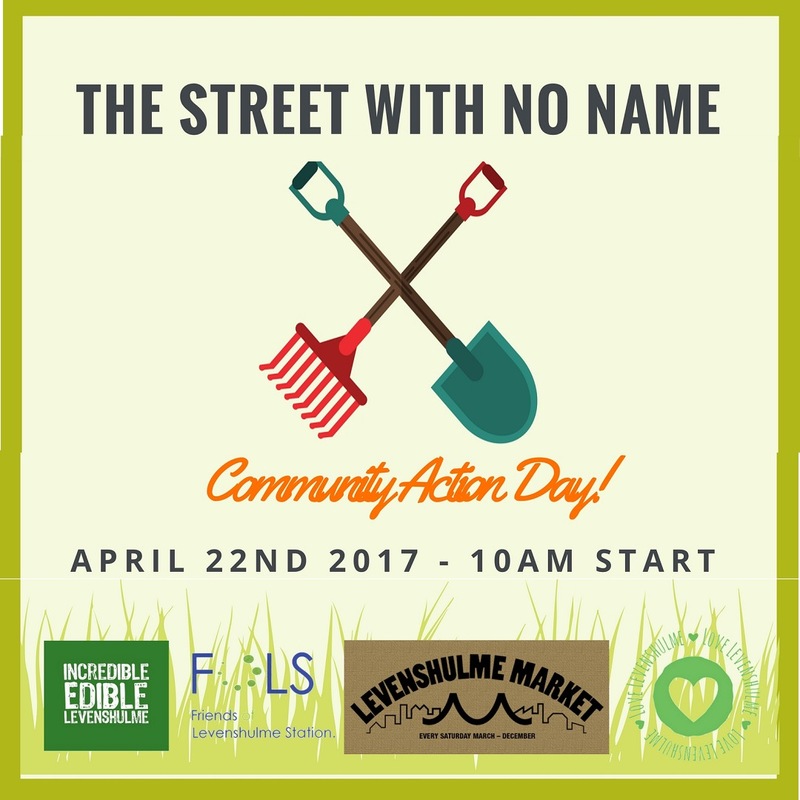 Announcing ‘the event with no name’ … a two week celebration of Arts, Creativity and Culture in Levenshulme and Gorton South. Between Saturday 24th June and Sunday 9th July 2017. As a spin-out from the Old Library campaign we are asking for contributors to a festival of “Art, Creativity and Culture”. If you are creative in any way, or have a venue, maybe planning an event anyway… please host or hold an activity that celebrates and shows off the creativity, diversity and energy of our community. crafts, comedy, and even food. Things you are passionate about, that make you happy, that express hope, that challenges us and brings us together, that inspires new ideas. Anything can be art if done with creativity. We’ll collect a list of events together, create an online brochure and publicise it. Some events may be fundraisers, but mostly its about the residents of our lovely area expressing themselves. Celebrating our community. Sharing the love. Thoughts welcome!. We’ve created an event page, and starting to gather ideas. If possible, some activities may happen in the Old Library… but mostly its about arts and creativity out in the community. And if you can think of a better name… add it below or on the event page. We’ll make a poll of the best ideas and crowdsource the final name! The effects of the notice will be to prohibit access and egress by vehicular traffic at the side roads connecting onto Stockport Road between Broom Lane and Crossley Road as specified in the schedule to this Notice. Between 07:00 hrs and 19 00hrs Weekends only. The City Council is satisfied that this prohibition is necessary in order to facilitate Highway Improvement Scheme works. It is expected that the works will be in progress between 22 April 2017 and 07 May 2017 Stockport Road will remain open at all times for the duration of the works. 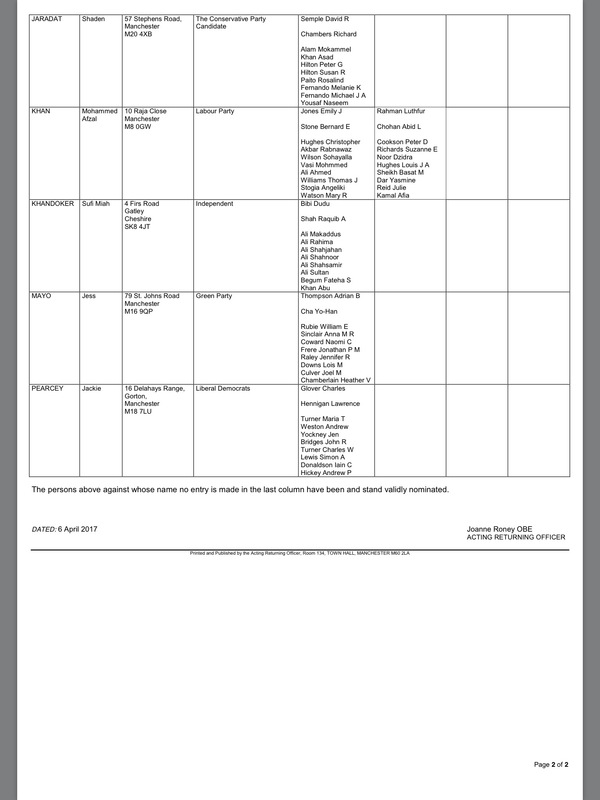 The list of candidates for the Manchester Gorton parliamentary by-election has been confirmed. 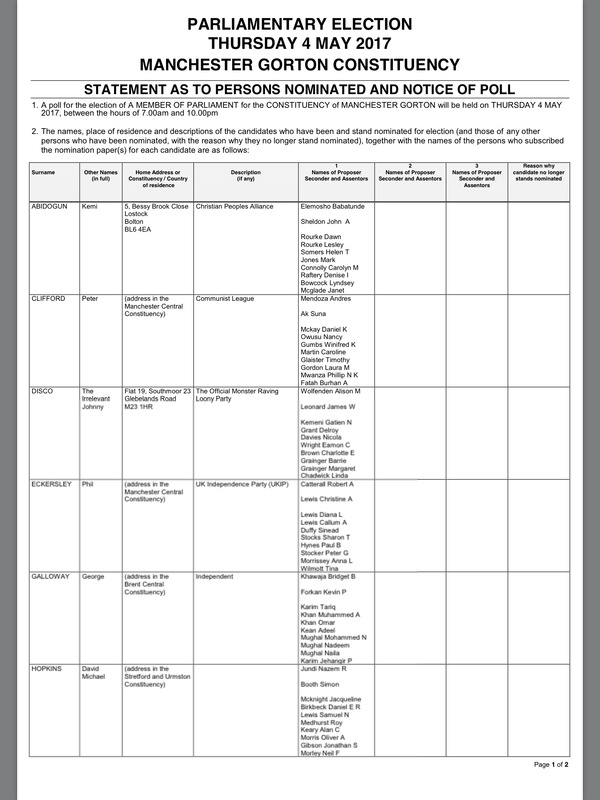 The hustings for candidates organised by Levenshulme Community Association takes place on Saturday 22nd April at the Jain Community Centre, 667/669 Stockport Road, Manchester, M12 4QE, starting at 19.00. On the 4th of May, all eyes will be on Levenshulme as we elect a new MP to replace the much-loved Gerald Kaufman. But there will be another important election that day that could possibly have more day-to-day impact on our neighbourhood – the election of a Greater Manchester ‘metro mayor’. The new mayor will cover all 10 boroughs of Greater Manchester and have powers over transport, policing and some aspects of planning too. He or she will play an important role in relation to devolution and will become something of a figurehead for our city – much like Boris Johnson or Sadiq Khan have done for London. But one of the crucial reasons for us having a new metro mayor is to make us feel closer to democratic decision-making. It is easy to be cynical – so how do we do this? For some time now, around 20 groups and organisations from all over Greater Manchester have been meeting to plan a special GM Citizen’s Assembly. 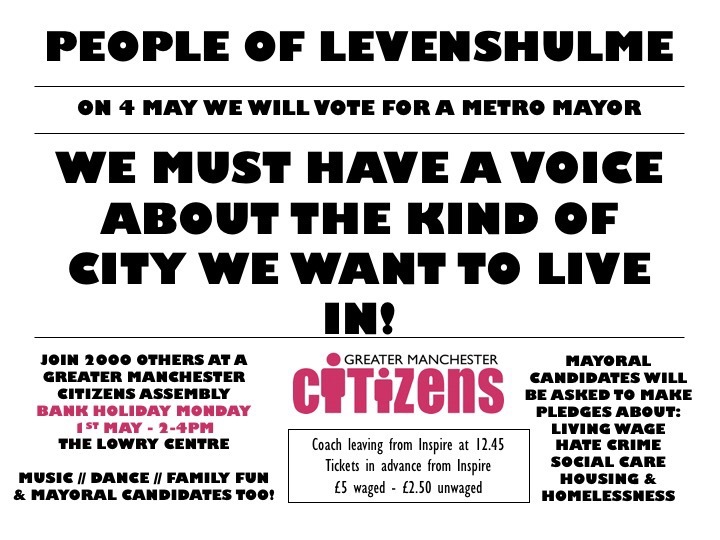 The plans is that over 1500 people will pack out the Lowry Theatre on Bank Holiday Monday 1st May and together we will tell all of the possible mayoral candidates about some of the big issues we are concerned about and demand that if they are elected they will do something about them. It’s a strategy that has worked very well in London and has led to the introduction of the London Living Wage which has benefited thousands and thousands of low-waged people living in the capital city. In Greater Manchester we are going to lobby the mayoral candidates on 4 big issues: cuts to social care; homelessness; hate crime; and the Living Wage. The Assembly won’t be boring! We understand it will be a bank holiday but we want people to make the most of the day. There will be music, drama, comedy, plays, powerful testimonies and of course hearing from the candidates themselves. We will be joined by the mayoral candidates, other surprise guests and Sir Peter Fahy. We want people to bring families and children. This is for ordinary families and people across our community. 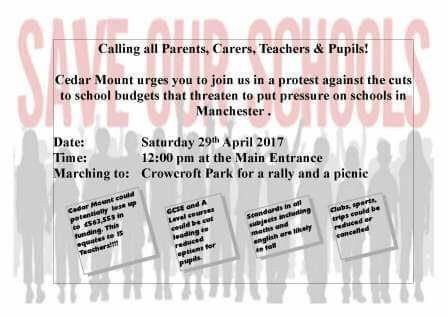 If you’d like to come along you need to sign up. You can do so online by clicking here. Or alternatively you can join the coach that is leaving from Inspire at 12.45pm. The event is free but you need to buy a coach ticket in advance – £5 for waged people; £2.50 for unwaged. If you want to find out more then don’t hesitate to contact me. 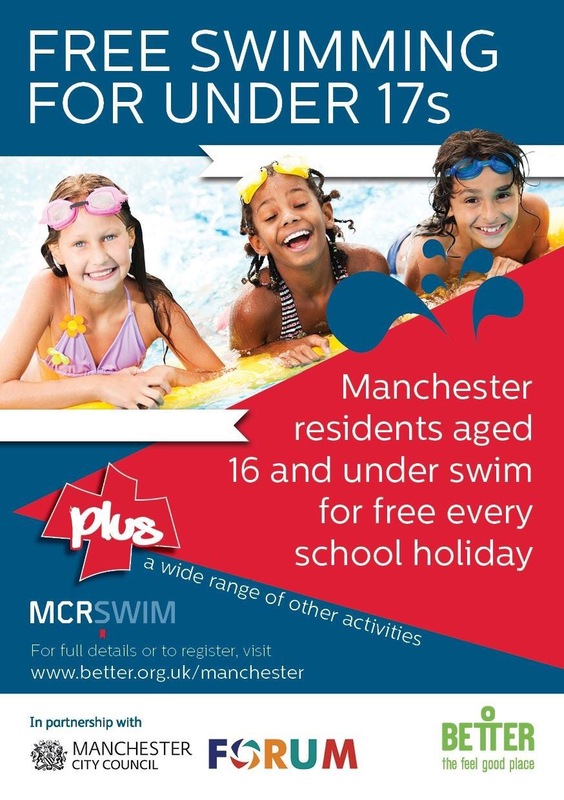 If you’re under 17 years old and live in Manchester you can get free swimming during the school holidays. 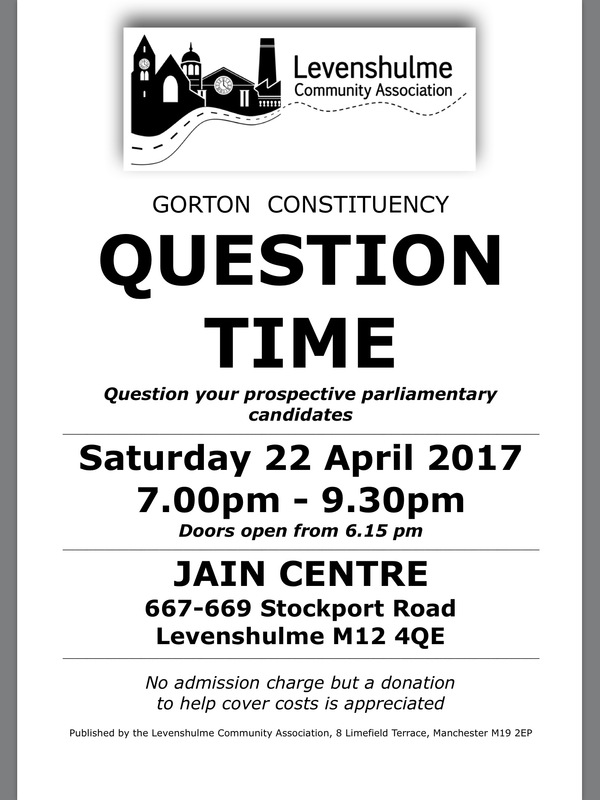 Levenshulme Community Association is pleased to confirm hustings for the Manchester Gorton parliamentary constituency by-election.